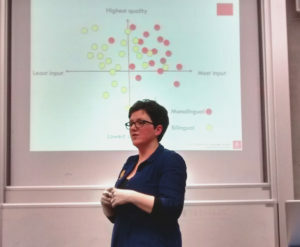 Last week, the Linguistic Circle at the School of Philosophy, Psychology and Language Sciences (PPLS) at the University of Edinburgh hosted a talk by Sharon Unsworth, Associate Professor of Second Language Acquisition at the Radboud University, the Netherlands. Born in Lancashire, Unsworth completed her PhD in Utrecht with a dissertation on the differences between adults and children in language acquisition. Aside from teaching, she is now the head of a research project exploring the cognitive and developmental aspects of multilingualism. Sharon Unsworth’s research is aimed investigating which factors contribute to the successful acquisition of two or more languages in childhood. In particular, she studies aspects of how children are exposed to the languages they use, how they use these languages, and the influence of the social contexts where these languages are used. In the past years, her research has helped progress the idea that the amount of input that children receive in their languages is important for their language proficiency. Currently, Unsworth is focusing on a new question: apart from quantity, what about the quality of input? The experience of bilingual families is in fact hugely varied: do aspects such as the variety and the number of speakers and the amount of language mixing benefit the way a child acquires and masters a language? In her talk, Dr. Unsworth shared with PPLS students and researchers work in progress on a study she is carrying out. In this study, Unsworth and her research team aim to understand whether being exposed to non-native speakers of a language has an impact on language learning in childhood. One of the aspects that characterizes bilingual families, with respect to monolingual ones, is the presence of non-native speakers – for instance, one of the parents or other members of the family. Previous studies suggest that non-native input is less rich than native input: for example, fewer words are used, and there may be some grammatical mistakes. But is non-native input really problematic for language learning? This question is relevant because some families may feel compelled to speak the language of the country they live in at home, and may give more space to non-native input in the official language than to native input in the heritage language. Does this impact the development of language skills in children? To answer to these questions, Unsworth and colleagues collected a vast amount of data from bilingual children aged 5 who live in families where one of the parents talks to them in Dutch but is not a native speaker of the language. The data collected are relative to the language proficiency of the children, as well as of the parents, and to the habits of language use in the home and the general cognitive abilities of the children. The preliminary analysis of this data set suggests that non-native input may play a role in the language acquisition of bilingual children, specifically, it seems that children exposed to more native Dutch have a richer vocabulary and grammar than those receiving non-native input. This is consistent with the idea that native language input is richer and more diverse. At the same time, however, these preliminary analyses also suggest that bilingual children may be able to overcome the limitations of the non-native input and succeed in learning a language despite the inconsistencies – in fact, possibly learning how to deal with inconsistencies such as mistakes. The Linguistic Circle is a research seminar that hosts invited talks on a range of Linguistics topics from high-profile speakers. It meets every week at the School of Philosophy, Psychology and Language Sciences at The University of Edinburgh.